Sailing season is upon us! Our smaller keelboats are already in the water, and our cruising boat will go in next week. Our Instruction Program is off to a great start. Classes in almost all of our categories are full at least through mid-July. More sessions will occasionally be added to the roster later in the season, so if you didn't have an opportunity register for the class you wanted, keep checking back on the Sail Chicago website for more opportunities. One of the reasons we aren't able to offer more classes is that our stalwart group of instructors is limited. If you're a member of Sail Chicago who's been a skipper for a couple of years and would like to share your enthusiasm for sailing with others, there's no better way to do that than by becoming an instructor. As an Instructor, you fulfill your annual service requirement and, depending upon the number of classes you teach, you can earn sailing credits. You are also eligible for a 40 percent discount on select Gill sailing gear. To learn more about how you can become a qualified instructor, contact our Lead Instructor, Matt Stuczynski. Registration is also open for our Racing Program. Several four-week racing sessions will be held as part of the Columbia Yacht Club's Wednesday evening inshore racing series. Racing is a great way to hone your sailing skills, to meet others who love to sail, and to experience the exhilaration that comes when competing in a highly-charged environment. It's also just a lot of fun! To learn more, visit the Sail Chicago website and click on "Race," or see the article below. Soon qualified Skippers will be able to sign out boats for private use when they're not being used in other Sail Chicago program activities. Remember, though, early in the season it's still cold, especially when you're on the water. If you're going out for a sail, be sure to dress appropriately. Wear a heavy, waterproof jacket, a warm hat, and consider purchasing waterproof outer pants. There's nothing worse than shivering in a cold, wet cockpit for a couple of hours while others on the boat who are warmly dressed are having a great time. The 2016 Colgate Racing Season is now open for registration. New this year: we have lowered prices for individual member registration ($150 for a 4-week session), and also have an option for reserving the boat for the entire season (for that option you'll have to fill it with your own crew). Sign up and join us for Wednesday night inshore racing from the Columbia Yacht Club--and there's free beer and fireworks at Columbia after each night's race! EVEN OUR SMALLEST BOAT IS READY! Our dinghy is essential for maintenance. 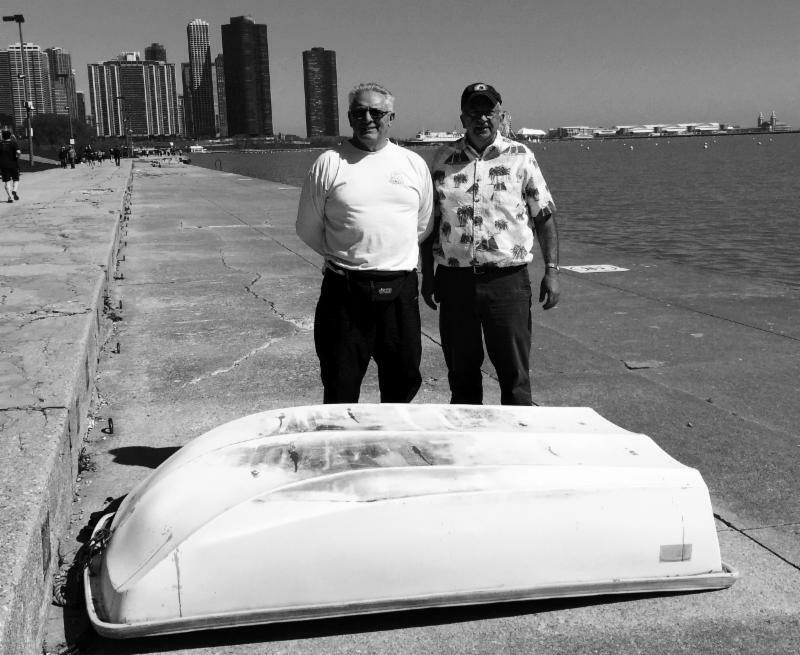 Wagy and Ric Smies, moved the Sail Chicago dinghy from the boatyard to its space along the Monroe Harbor seawall. The dinghy is used by our maintenance team to move materials to and from our boats moored in Monroe Harbor. It was one part of a much larger effort to ready our fleet for the 2016 sailing season. Our boats are now in the water, thanks to the countless volunteer hours logged by our other member-volunteers who are part of our maintenance and boat teams. Our heartfelt thanks to you for making this sailing season possible! And a special thanks to Tom Peterson for spearheading this year's effort. For more information on these and other open positions, contact Chris Garvey. We had some good learning and insightful discussion at our first Tiller Time Training on April 26th. For those who have thought about becoming a Tiller Time skipper and being involved in Instruction, we are offering the chance to bone-up on some basic sailing skills as well as learn some tips and tricks for being an effective Tiller Time skipper. We plan to offer another session, in conjunction with our Pre-Sail Orientation (PSO), on Thursday, May 19th from 6-9 p.m. Please contact me if you would like to attend. We look forward to some informative talk at Tiller Time Training! Calling all new skippers from 2015. Those who gained Sail Chicago Skipper status in 2015 and would like a refresher sail, we will be putting together groups of you with Sail Chicago Instructors for a refresher sail this spring to go over some of your new skills that you may have forgotten over the winter. New Skippers are also most welcome to attend a Pre-Sail Orientation (dates are on the website under "Learn") in order to refresh what you first learned last year as well as meet some new students and other Sail Chicago Instructors. If you're interested in a refresher sail, please contact Lead Instructor Matt Stuczynski. New tender passes and parking passes are now in the same lockboxes with the same combinations we used last year and are available for immediate use. This year the Harbormaster will have a new system for passes. Each person boarding an outgoing tender will individually swipe a pass through a card reader. No swipe will be needed for the return trip. The change means that we will have some new procedures for tender pass use. All tender passes are flex passes. The skipper signs out in the register located in the lockbox the the number of passes they are using, the boat they are sailing, and the time and date. The skipper distributes the passes to the crew who swipes the pass as they enter the tender. The skipper immediately collects all the passes from the crew and returns them to the lockbox at the end of the sail, signing in the register the time they were returned. The procedure for using parking passes is the same as last year. If anyone is unsure about the procedures for passes please look at the front page of the pass register in the lockbox for easy explanations. As a courtesy to other sailors, please return all passes promptly. If you lose a pass please report it immediately to MPP@sailchicago.org. Here's to better sailing weather soon. As we prepare for another season on the sometimes busy nearshore waters of Lake Michigan, it's a good time to review what mariners call the "Rules of the Road." We usually reduce them to a handful of rules that govern crossing, meeting, and overtaking situations between vessels. However, those rules are a small part of a comprehensive set of US Coast Guard regulations that were first formalized in the Convention on the International Regulations for Preventing Collisions at Sea, 1972, and are commonly called 72 COLREGS. You will also see them referred to as "Navigation Rules, International--Inland". The Inland Rules apply to the Great Lakes, bays adjacent to the oceans, and major rivers in the US. So, the Inland Rules apply to us. The Rules are available here. All skippers are responsible for knowing the Rules. Each rule contains paragraphs that are applicable in both international and inland waters as well as rules applicable in one or the other. So, be sure you are checking the applicable inland rule. It's a good pre-season exercise to review the Rules. It's impossible to summarize the Rules in this article. But there are a few key rules: Rule 1 states that the Rules apply to every vessel, always, everywhere. Rule 2 holds every skipper responsible for following the rules--no exceptions. Rule 5 requires every vessel to maintain a look-out at all times. Rule 6 requires you to proceed at a safe speed such that you can avoid collision and stop in an appropriate distance. Rule 7 says that if you think there is a risk of collision, then there is a risk, and you have to act accordingly. Rule 8 requires you to act in a positive manner that is clear to other vessels, in ample time to avoid collision, and is safe. The overriding rule is to take whatever action is necessary to avoid collision, even if another boat is not following the rules and forces you to deviate from the rules to avoid collision. The Rules do not quantify these concepts--what is a safe speed, when to act to avoid collision, how much to turn, etc. It is up to the individual mariner to determine a safe speed, given the vessel, visibility, traffic, and sea state, for example. And Rule 2 means there are no excuses, period. Understanding and applying the Rules are an essential part of developing good seamanship. Next month we will review the meeting, crossing, and overtaking Rules in more detail. Sail Chicago's Cruising Program is off to a great start. The Coastal Navigation course was fully booked within hours of its listing on our web site. The momentum continued when all 12 students, four coaches and instructor Bob Lapin met for the first session of the two-session class at the excellent downtown facilities provided by Grant Thornton. The students took to the demonstration charts, parallel rulers, and dividers as quickly as they do to sailing the Colgates and were soon locating positions, charting courses, and converting compass readings between True and Magnetic. The enthusiasm continued unabated as all of the students were eager to learn more about the mechanics and maintenance of a sailboat with an inboard engine by volunteering to participate in the maintenance of our cruising boat, Priorities. Following the class, participants navigated across the street to Ronny's Steak House for food, refreshment, and sailing comradery. The Sail Chicago Board met on April 14. Some of the items discussed are being passed on to our members to keep them apprised of current activity. 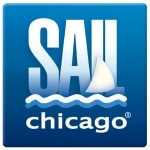 Sail Chicago is in discussions with Columbia yacht Club about a closer relationship. We have boats and they have facilities. Stay tuned for specifics as they develop. Instruction reports that we have 4 or 5 new instructors and several others are in the pipeline for later this season. The number of instructors is the limiting factor in scheduling classes. We need more instructors to satisfy the needs of our members. Twenty nine instructors attended the instructors meeting on Saturday 4/2/16 and reviewed plans for the 2016 season. Michael Swisher needs volunteers to help with scheduling. Several action assignments were taken to address this need. In an effort to bring more members into our racing program, students registered for classes in July and August will be contacted and encouraged to sign up for racing in May and June to get back on the water earlier than their classes will allow. Cruising - The engine for Priorities has been rebuilt and reinstalled. We are all anxious to check it out. The Board also approved the assembling of a committee to begin the search for a newer cruiser. The committee is being formed and criteria for a new boat established.